Hi! 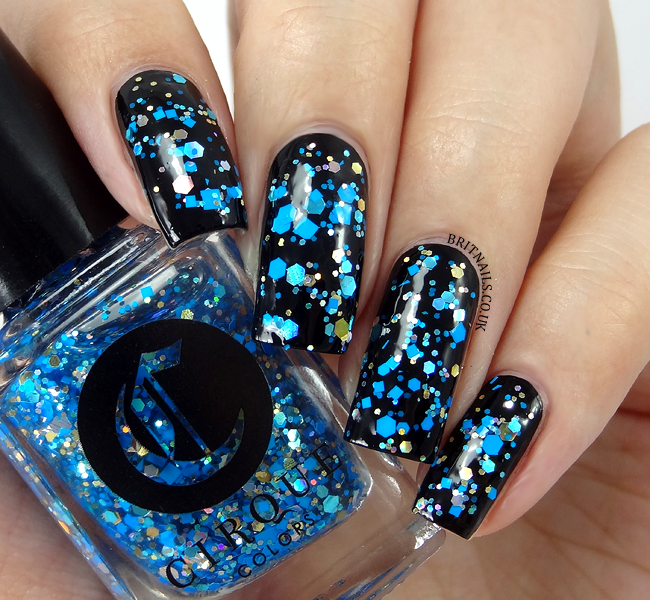 Today, I'm featuring a new-to-the-blog brand, Cirque Colors! 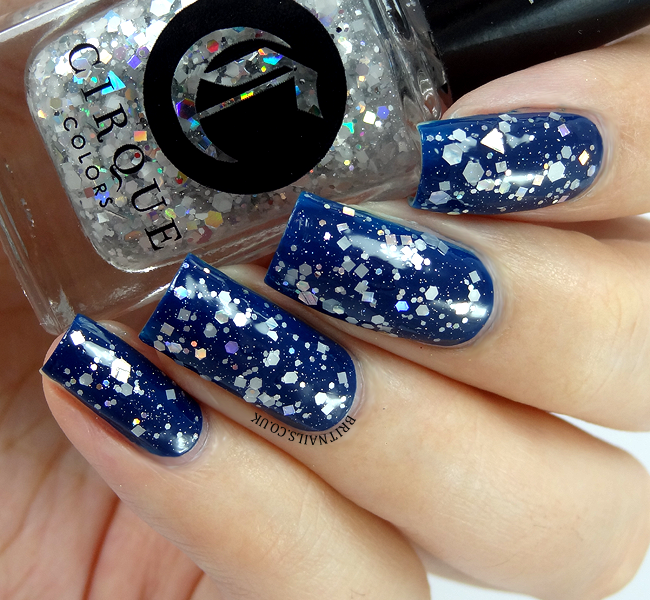 I'm really excited to have them on my blog, I've admired their creations for a while (so you can imagine my glee when Cirque founder Annie asked if I would like to try some polishes!) 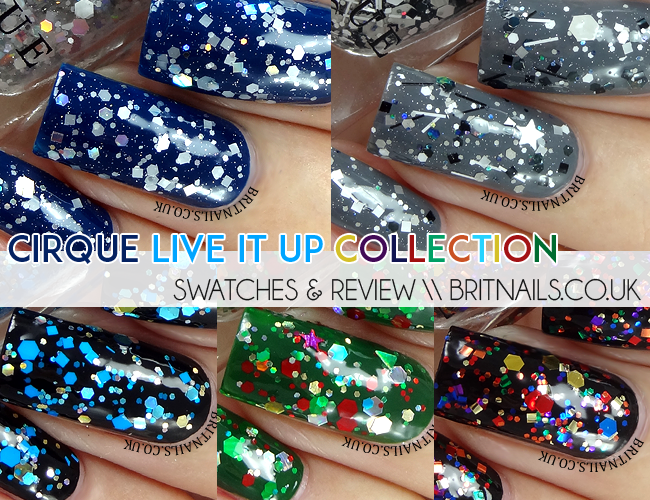 Live It Up is Cirque's Holiday 2014 collection, made up of 5 dazzling glitter toppers inspired by holiday celebrations and classic dance hits! My first reaction upon receiving these polishes was literally "OOOH WOW HOW PRETTY!" and I twirled them around in awe before opening them. 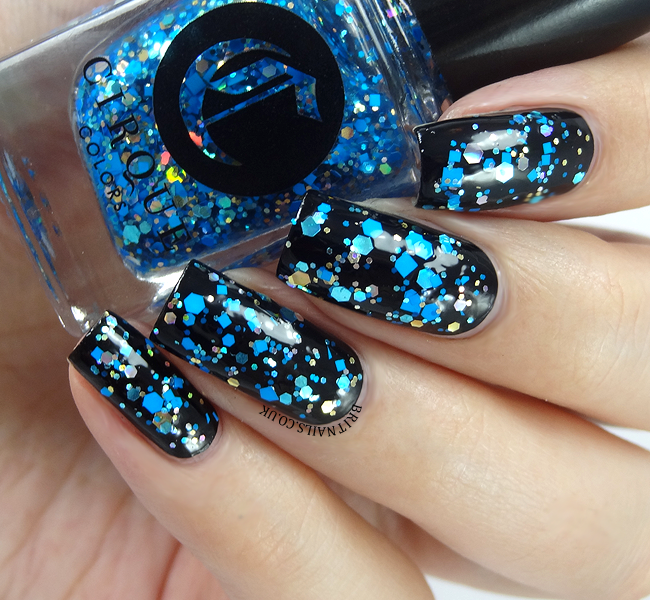 Let's face it, most of us are drawn to glitters whether we like it or not. I could immediately tell these were well made, high quality polishes, and I've teamed them up with some cremes that I think match them well. For all of my swatches I've used 1 coat, plus a little bit of dabbing to fill in any gaps where necessary. 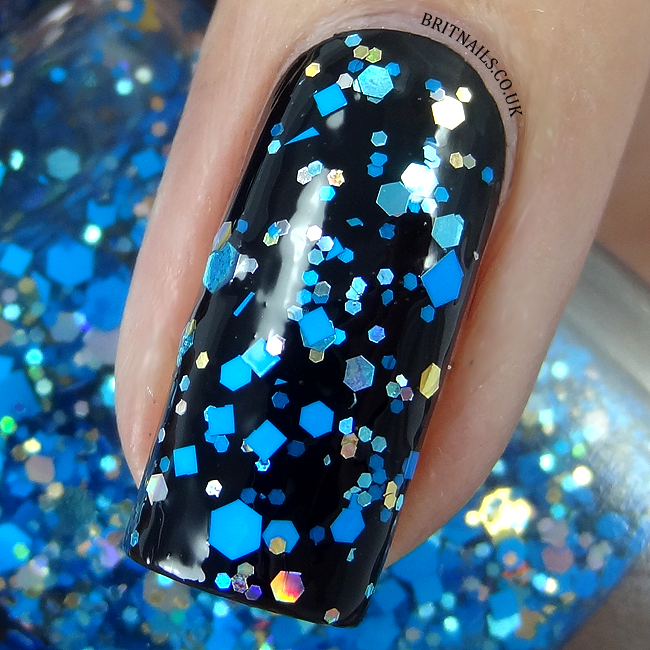 The main feature of 8 Crazy Nights* (Limited Edition) is matte blue square and hex glitters. It also has gold glitter and shiny holographic pieces! I've used 1 coat plus top coat over Cirque Memento Mori (also sent for review) which is the most luxurious, 1-coat black creme ever! If you use black cremes a lot, I would highly recommend it. 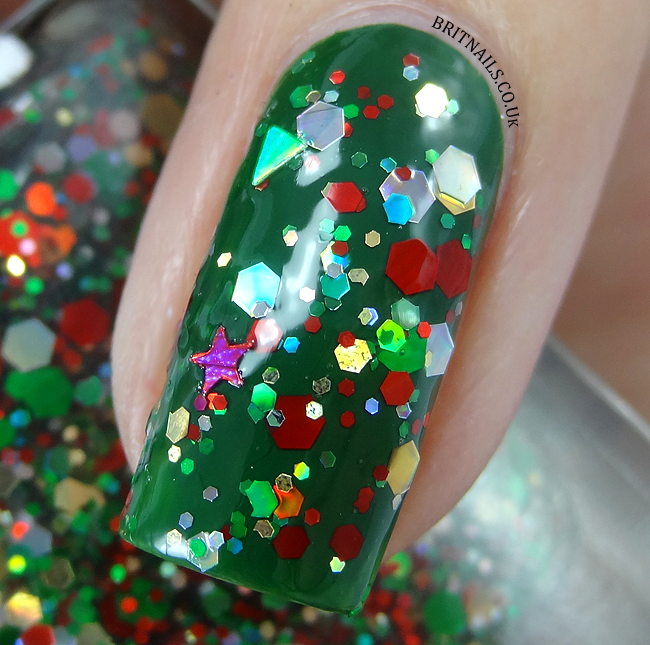 Holo-day Cheer* (Limited Edition) is a super festive mix of green, red and gold glitters, with the addition of tiny stars and triangles! There's also small circle glitter and holographic silver pieces. 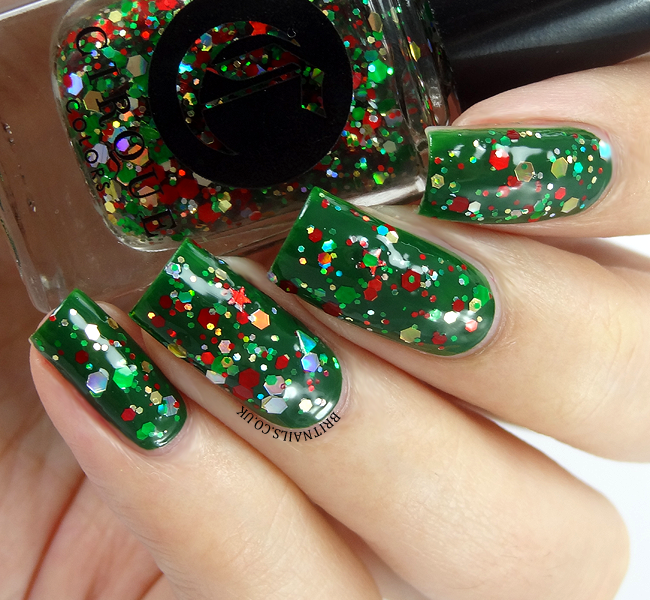 I used 1 coat over China Glaze Holly-Day, plus top coat. 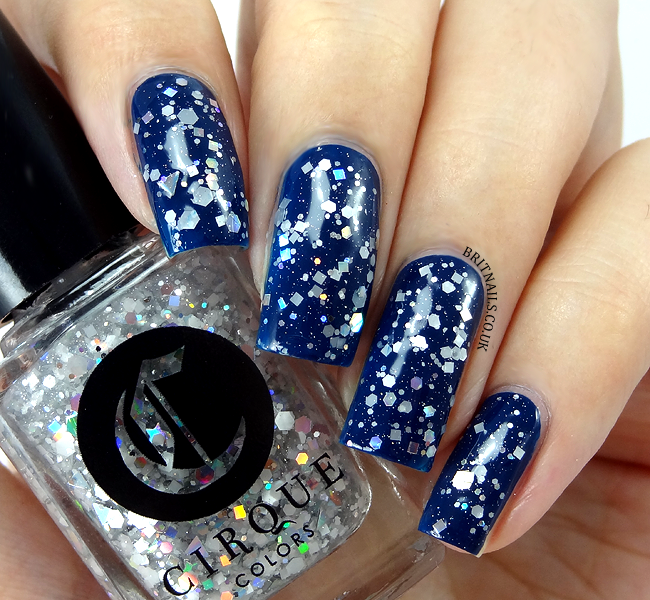 1999 is a wintery mix of white and silver glitters, with holographic flashes and teeny tiny holographic micro glitter. I spotted some triangles in there too! I've used 1 coat over Barry M Blackberry plus top coat. 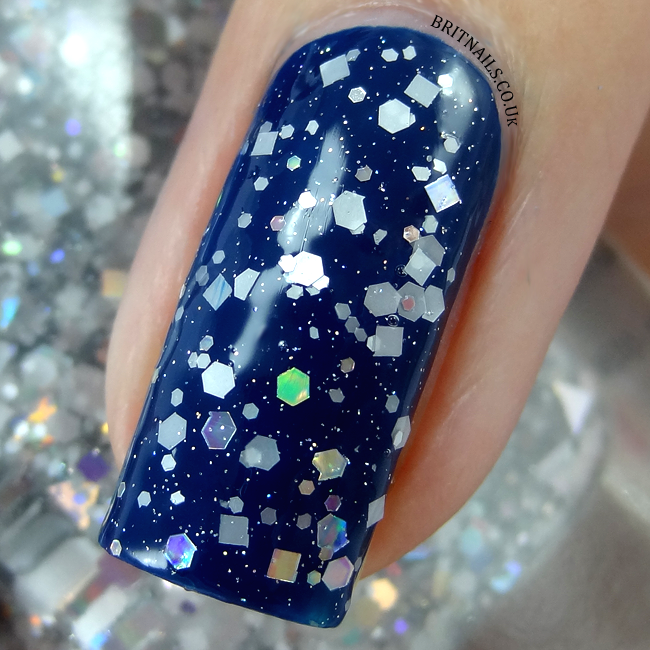 I really love the combination of polishes here, it looks like a night time snowfall scene! 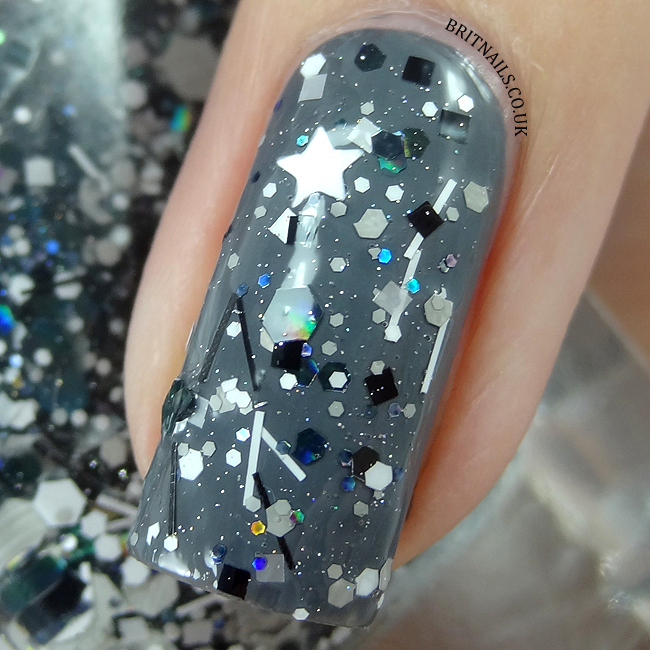 One More Time (I challenge you to not get that song stuck in your head now) features black, white and grey glitters - hexes, squares, larger stars and tiny bars! 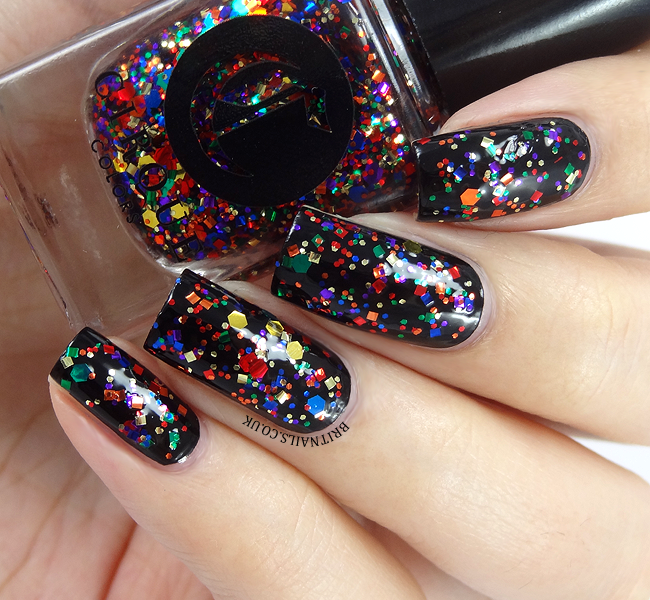 There's also lots of fine holographic micro glitter which is just beautiful. I've used 1 coat over Barry M Grey plus top coat. 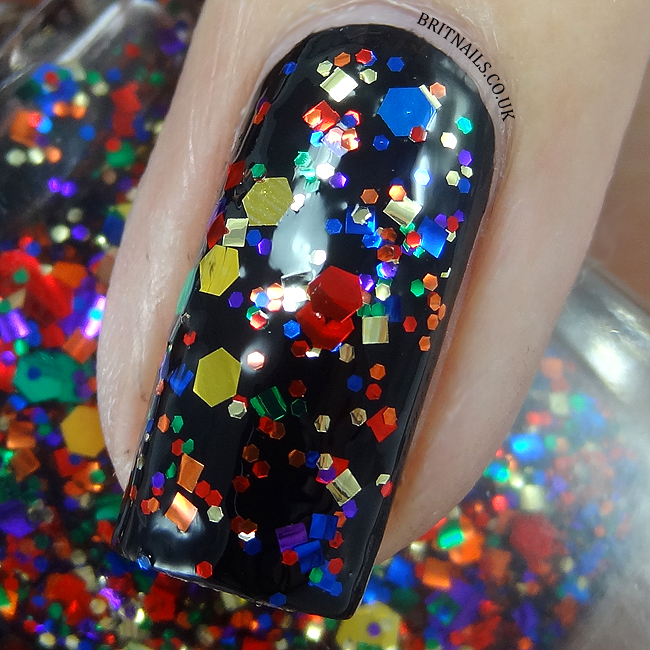 Finally, Let's Dance is a crazy colourful mix of hexes and squares, giving it a confetti look. So many colours here...I can see gold, orange, red, blue, purple and green! I've used 1 coat over Cirque Memento Mori plus top coat. I think this one is my favourite! 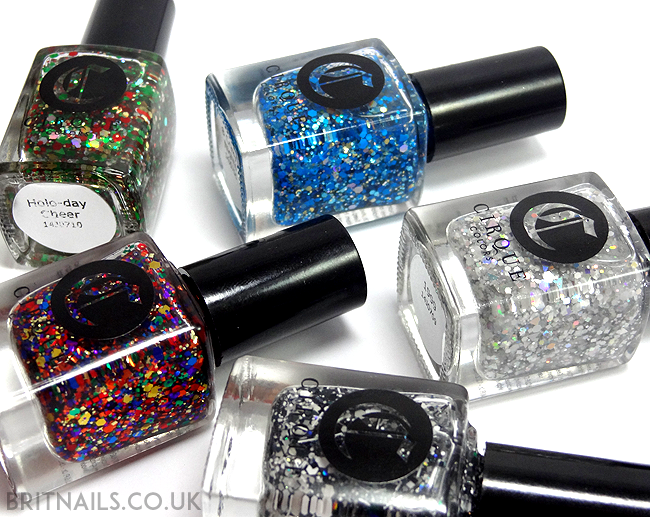 This is a beautiful collection of glitters, they're all very different from each other and unique in their own way. I'm thoroughly impressed with my first experience of Cirque Colors! - Check the stockists page to see where they're available in your part of the world! *20% of net proceeds from the sale of Holo-Day Cheer & 8 Crazy Nights will be donated to City Harvest: A food rescue organization dedicated to helping feed the nearly 1.5 million New Yorkers facing hunger. Im in love! Such a beautiful collection. It really is! 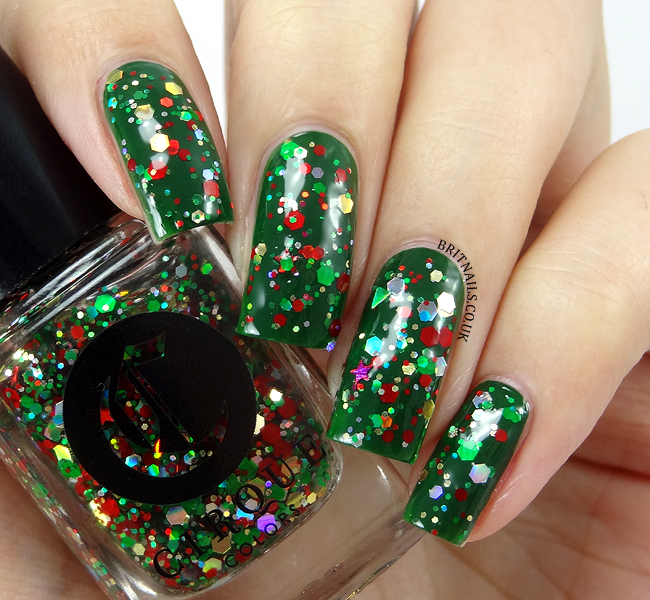 I think a lot of people are tiring of glitter at the moment. I can't help myself though!